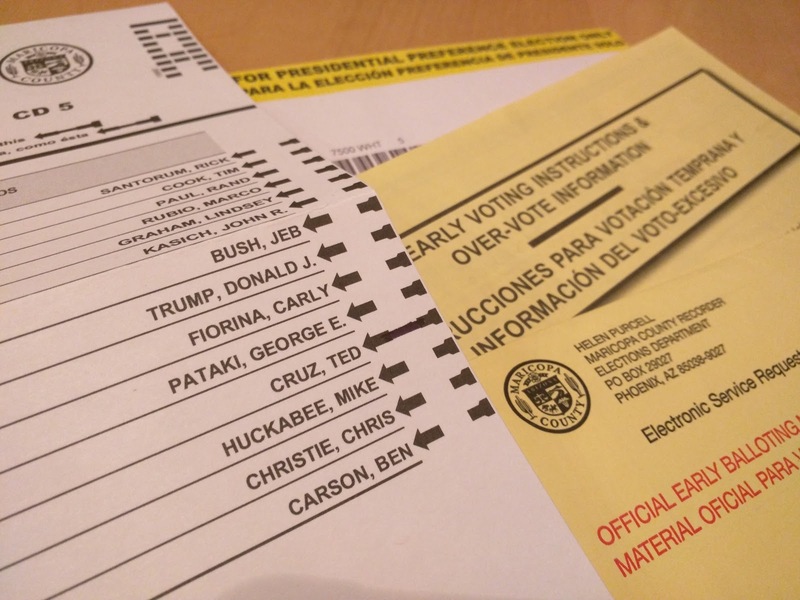 I just finished filling out my early ballot for Arizona's Presidential Preference Election. I know, I know...so much for voting early! Come to think of it, I don't think I've ever actually mailed an early ballot. I always procrastinate and end up having to hand-deliver my ballot to a polling place. But this time my delay was intentional, and providential, since the candidate I was originally planning to vote for dropped out of the race. Since I knew that was a possibility, I waited to vote, because I wanted this vote to count. I've been looking forward to voting in this election more than any other I can remember (except maybe for my first one). Not only is it likely the most important election in which I will have had the opportunity to participate, but after being apathetic about politics for so long, I read a book last summer that completely changed my attitude, and made me actually excited about casting this particular vote. Reading The Conservative Heart reignited my belief in conservatism -- the idea that limiting the power of government to unleash the power of free enterprise is the best way to help people better themselves. It dovetailed with all I'd been learning about history, and my frustration with the current state of politics and government. The book also explained why I'd begun to doubt conservatism. Conservatives haven't been very successful in communicating the heart of their ideas and beliefs, nor in reporting the success that the implementation of those ideas has reaped throughout the world. They come across as cerebral, focused on money, and lacking compassion. I'd begun to believe that narrative, and since I consider myself a compassionate person, that led to questioning the morality and effectiveness of conservatism. So to be reminded of the facts -- that conservative principles help people -- and assured that not only can I be a conservative and still care about the well-being of others, but that I should be a conservative if I care about the well-being of others -- was refreshing. One principle from the book that really resonated with me is the importance of fighting for, not against, things. It's far easier to be reactionary and fight against things, but real progress will only happen when we fight for things. I was able to put this principle into practice right away, in selecting a presidential candidate to fight for. I've never been very excited about any of the presidential candidates I voted for. They were "the lesser of the evils" so I voted for them because I thought they were better than "the other guy" and had the best chance of winning. Now suddenly I found myself in the unheard-of position of trying to choose "the greater of the goods" from a long list of candidates I could actually see myself getting excited about! How was I to choose from among them? There was really only one thing for an avid reader like myself to do. I decided to read as many of the candidates' books as I could in order to hear their beliefs, vision, and stories in their own words, rather than through the filter of the media. I must confess I didn't watched any of the debates other than clips, partly because I'm not sure how I would've watched them since we don't have access to broadcast or cable TV (we stream everything), partly because I haven't had the time to dedicate an entire evening to watching a debate (it's much easier to read an ebook on my phone when I have a few minutes here and there) and partly because I didn't want to be swayed by a candidate's "charisma" or lack thereof. I prefer to engage with their ideas rather than their personality. Thankfully I was able to checkout many of their books through the Greater Phoenix Digital Library. I finished seven books and partially read five more, and I learned quite a lot. I went back and forth between candidates, wrestling with which characteristics and qualities are most important for our country's chief executive, and trying to decide who best embodied what we need in a POTUS. Carly Fiorina was my first choice. She has the executive experience necessary to cut through the out-of-control bureaucracy and over-regulation in the Executive Branch which, along with the highest corporate taxes in the world, are strangling our economy. Since it became clear early on that she was not going to win the nomination, and I didn't want to throw my vote away when there were plenty of perfectly good alternatives available, I then began to go back and forth between Ted Cruz and Marco Rubio. Though very similar in many ways, they both had unique points in their favor. Ted Cruz knows the Constitution backwards and forwards and defended it vigorously before the Supreme Court in his position as Texas' Solicitor General. Marco Rubio is a student of history and especially strong in the area of foreign affairs, which is a key aspect of the role of POTUS (which is why, much as I liked Ben Carson, I decided he wasn't the best choice for president). Both Cruz and Rubio have proven their commitment to conservative principles during their time in office, but in different ways. Rubio appears to carefully choose to fight battles he thinks he can win, because his goal is to accomplish something rather than nothing. Cruz seems to choose battles he knows he can't win in order to reveal the sad truth of the compromises and political games being played in Washington. In the end I decided that Rubio's approach would be more effective in actually accomplishing a conservative agenda, thereby doing the most to help our country and the world, so I was planning to vote for him. 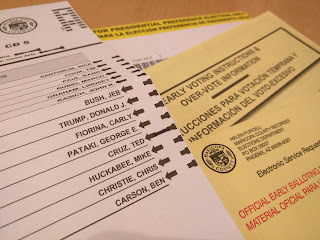 Sadly, long before I was able to cast my vote it became clear that there was a downside to having so many good candidates to choose from -- it meant that the conservative vote got split, allowing a very anti-conservative candidate to prevail, and leading Rubio to eventually suspend his campaign. So as the time has now come for me and other Arizonans to cast our vote for the Republican presidential nominee, I find my choices narrowed for me to the point where I don't really have a choice other than to vote for Ted Cruz. That isn't necessarily a bad thing. I don't feel I'm having to choose between the lesser of the two evils, just the lesser of the good choices I'd had previously. I can live with that. I'm still fighting for something -- for the conservative principles that I believe will benefit my fellow Americans and countless people around the world!